It's hard for me to think about riding motorcycles without thinking of a joining a motorcycle club. I think I am a confident rider and I think I know my way around my bike. I'm not nervous when I ride, and I have gotten over the whole thing about people looking at me funny because I'm a woman riding a motorcycle. I enjoy riding my bike around and I do ride it, a lot. But what I enjoy even more is riding with my club. I like the women in my club. We all get along (some better than others!) and we enjoy each other's company. We've all learned a thing or two about each other's riding habits and tendencies. And we've all come to rely on each other for companionship. It's become like an extended family. Riding clubs are important for women, not only because they provide support and safety while riding, but also because they provide support for every day life. Finding a riding club that suits you can be a somewhat tricky process. If you are new to riding or new to an area, you can start looking for a club by asking around the bike shops in the area. There might be a message board there, and the people who work in the bike shop usually know what the bike clubs are and who you should contact. You can use the Internet to help you search for a motorcycle club as well. Many local women's motorcycle clubs have their own websites and will list activities and how to contact them. Take a look at the things they do and the places they go and see if they interest you. If so, contact them and see what it takes to try them out. Spend some time trying to figure out what you're looking for in a riding club. I wanted a club that was a group of women who would go out and do things. I really didn't want to do the same rides again and again and I'm not big for just hanging around looking at my bike when I get to a place. I like to have different destinations and I like to have a purpose to my trips. It can be sightseeing, shopping, or visiting someone. It usually doesn't matter. I just like to have a purpose. I also like to get involved in charitable events. I like to join in on rides that raise money for different charities. I've got many friends who feel the same way, so our club organizes rides and events that are designed to help fundraise. Many women ride primarily with their partners. This is a great thing for a couple to do together, and it can provide hours of entertainment and bonding. Many couples like to ride with other couples and plan trips and adventures with them. Finding a motorcycle club for couples can be a great idea for those people who like to socialize with other couples. 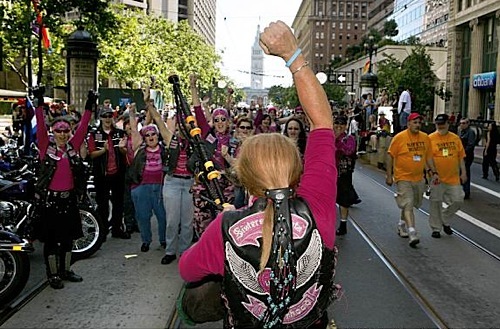 Women's motorcycle clubs can be great for social and recreational purposes, but many clubs are including activities that focus on safety and education. Your club should encourage you to ride safely and should promote safe riding habits. Motorcycle clubs come in all shapes and sizes, and you need to find one that fits your needs. Joining a club is a great idea because it increases your opportunities to ride, it widens your social circle, and it creates a place where you can safely ride with people who are looking out for you.